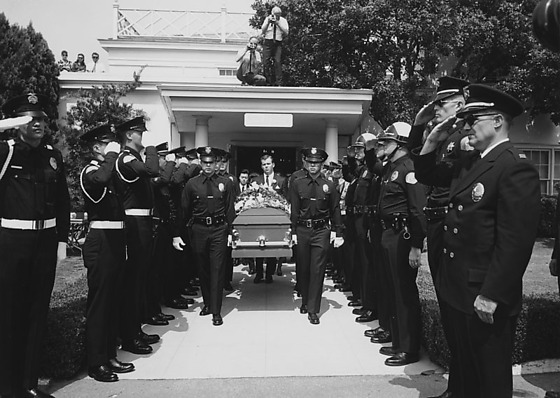 Funeral of Los Angeles Police officer Gary W. Murakami at Utter McKinley Wilshire Chapel, Los Angeles, California, September 9, 1968. 3P and 6N: Murakami's son, Keith, dressed in sailor's outfit and hat, shakes hands with Caucasian uniformed police officer as two Asian police officers stand by. Caucasian man in suit and eyeglasses stands at left; Japanese man stands in profile in foreground left; California Highway patrol officer in uniform stands with back to viewer at right. 4P and 8N: Murakami's son, Keith, dressed in sailor's outfit and hat, holds hands with man in suit standing next to Caucasian uniformed police officer. Boy holds a toy pistol in holster over his shoulder while man holds a long white box. Two women stand behind them to the right. Group of Police officers stand in back to the left; group of Highway Patrol officers stand back at right. Cars parked in front of buildings in background. 5N: Family and mourners walking on sidewalk. 7N: Murakami's son, Keith, dressed in sailor's outfit and hat, shakes hands with Caucasian uniformed police officer standing in a row extending into background. Boy holds a toy pistol in holster over his shoulder. 10N: Japanese uniformed Police officer carries Murakami's son, Keith, in sailor's outfit and hat. They are surrounded by other officers in parking lot. Boy holds a toy pistol in holster over his shoulder. Two African American men in suits stand at far right. 11N: Older Japanese woman in black dress and hat is asssisted by man in suit and woman with netting over her hair as they walk into building. Gary W. Murakami was killed three days after graduating from the Police Academy. One thousand people attended his funeral. The Honor Guard at his funeral consisted of 400 police officers, several sheriff's deputies and a unit of Explorer scouts.